I love to add fall fruits to my holiday stuffing to capture the smells and flavor of the season. 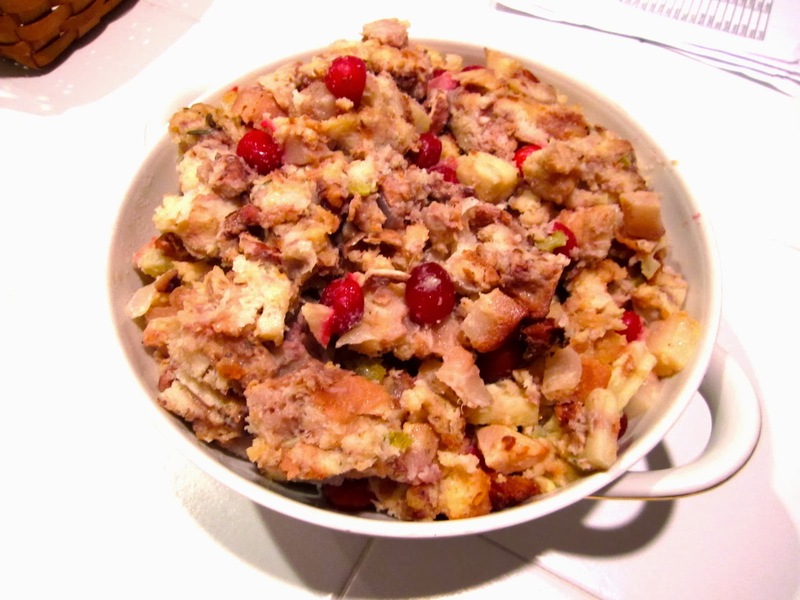 My Savory Fruit and Nut stuffing combines apples, pears, and cranberries with toasty pecans. A wonderful addition to my stuffing favorites. You can either stuff the turkey or bake to serve. In a large skillet melt butter over medium heat. Add onions and celery; cook about 5 minutes until tender but not browned. Add apples, pears and cranberries; cook for 5 minutes more until apples are tender. Remove from heat. In an extra large bowl toss together onion mixture and bread cubes. Let stand 10 minutes. In a small bowl stir together eggs, broth, salt, thyme sage and pepper. Drizzle egg mixture over bread, tossing lightly to combine. Fold in pecans. Use to stuff turkey or you can bake uncovered at 375 for 20 minutes. To make ahead: Prepare as directed and can be refrigerated for 1 day. Let stand a room temperature then bake as directed.